Now that fall has arrived in Southeast Texas, that can only mean one thing: thousands of individuals will soon find themselves discovering cockroaches in their homes and commercial properties. These pesky insects invade indoor spaces this time of year in search of food and water. As the temperature begins to drop outdoors, these resources are not as common outside as they are inside, and that is all the motivation these pests need to move on in. 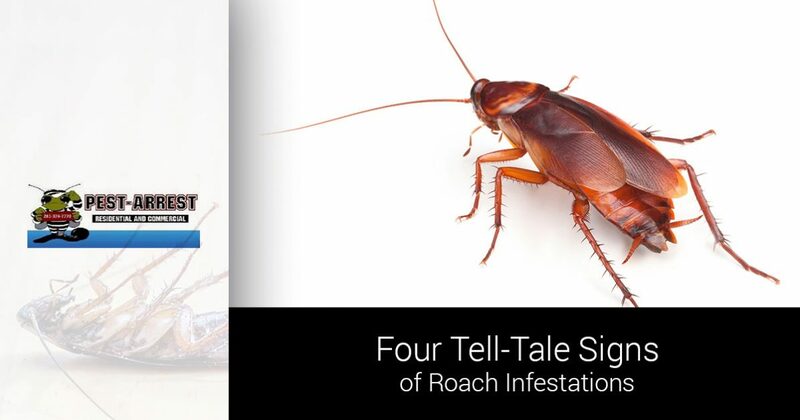 Knowing the tell-tale signs of roach infestations can help you stop an infestation in its early stages before it gets out of control. Pest Arrest is your Top Rated Local® pest control company in Spring, and we’ll review the most common warning signs of a cockroach infestation in today’s post. Once you’ve reviewed them, contact our local exterminators to schedule your cockroach inspection! Let’s go ahead and address one of the most obvious signs of roach infestations first. Seeing a cockroach — dead or alive — is a sure way to know if these pests have set up residence in your home or office. Cockroaches are nocturnal, so it is very uncommon to see them during the day. If you see one scampering about during the day, or if you discover several dead roaches in your home or office, it’s likely you have an advanced infestation. 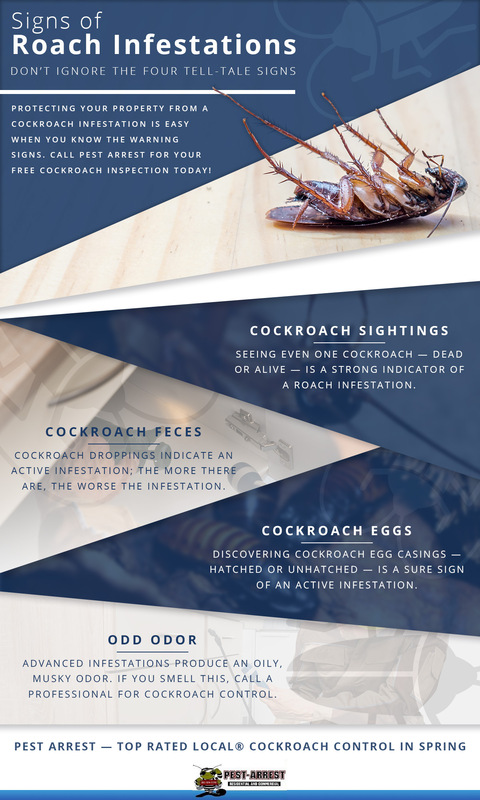 Spotting cockroach excrement in your kitchen or bathroom is also a sure sign that you have an infestation, but you have to know what to look for. Smaller roaches leave behind droppings that look similar to coffee grounds or black pepper, and larger roaches will leave larger droppings. The amount of feces you find is a good indicator as to how advanced the infestation is, and areas that have a high concentration of excrement are indicative of high roach traffic areas. Cockroaches are prolific breeders. When they reproduce, they don’t lay just one egg; they produce brown, oval-shaped egg casings (called oothecae) that can house up to 50 eggs depending on the species. Some roaches will carry these egg casings with them until they hatch. Others will hide them in cracks and crevices, behind furniture, inside of books, and other safe places. Finally, you may discover a common non-visual indicator that your home has been invaded by cockroaches, as advanced cockroach infestations produce a very distinct odor. What do cockroaches smell like? Many describe the odor as oily and musky. Once an infestation has gotten to the point of producing this unpleasant smell, it is time to call in an experienced exterminator for professional roach control. Have you noticed any of these warning signs of roach infestations in your home? If so, don’t take matters into your own hands. Some species of cockroaches, like German cockroaches, are especially resistant to certain insecticides, making it all the more important to hire an experienced pest control company. Our trained exterminators can quickly and accurately identify the type of cockroach infestation you’re dealing with to devise an effective pest management solution, and we are happy to provide free residential and commercial cockroach inspections. Ready to get started? Call us at 281-825-5659 today, or request your inspection online now!